Every Chick‑fil‑A sandwich is filled with horrific animal abuse. A new Mercy For Animals undercover investigation at multiple Chick‑fil‑A suppliers reveals baby birds being violently slammed into transport crates and having their legs and wings broken before being electrocuted and then scalded alive. »Go behind the scenes to learn more. Sign the petition to tell Chick‑fil‑A you won't stand for blatant animal cruelty. 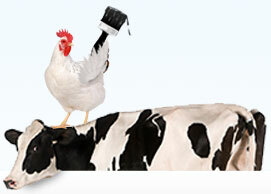 We’ll send the petition to Chick‑fil‑A’s top executives.